Canine Cushing’s disease, more specifically known as hyperadrenocorticism, is a condition in which excess levels of cortisol are produced by the adrenal glands. Most commonly found in older dogs, hyperadrenocorticism is more common than you might think. Symptoms include excessive hair loss, increased drinking/urination, or a dog not eating. One of the many treatment options for hyperadrenocorticism is Vetoryl. 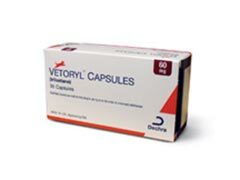 Vetoryl for dogs helps inhibit the overproduction of hormones, and to treat tumors that form on the glands—one of the main causes of the hormone overproduction. Many claim that Vetoryl for dogs showed greater improvement than Lysodren for dogs. While one of the more effective treatments, Vetoryl for dogs has shown some side effects. Any owner about to be put their dog on the medication should inform their veterinarian of any prior cases of liver or kidney disease, and any current medications. Some serious side effects can occur, and should they do the dog should be taken off Vetoryl immediately, and given immediate veterinary care. These side effects include allergic reaction, severe depression, bloody diarrhea, or collapse. However, Vetoryl for dogs has been proven safe and effective in most cases of hyperadrenocorticism. There are some risks of minor side effects, mainly a decrease in appetite, vomiting, diarrhea, and lethargy. Considering that a pill treatment for hyperadrenocorticism must be continued for the remainder of a dog’s life, it is best to shop online stores for Vetoryl for dogs—if dog health insurance is not an option.